I’m delighted to be back in Dhaka for the third time as Minister for Asia, and so soon after my colleague the Secretary of State for International Development. It’s a level of engagement that clearly demonstrates the UK’s strong commitment to our relationship with Bangladesh. This is a time of change for both our countries. For our part, the UK is leaving the EU and seeking new opportunities around the world, building on our strong historic, commercial, and cultural links. There are few places in the world where those links are stronger than here in South Asia, thanks to the thousands of personal connections between us. There are now some 600,000 British citizens of Bangladeshi heritage, many of them in my own constituency in London. We greatly value their contribution to all walks of British life. Here in Bangladesh I know you are looking forward to your 50th anniversary in two years’ time, and to celebrating your many achievements, from bringing over 50 million people out of extreme poverty since 1990, to increasing life expectancy and reducing infant mortality, to boosting your economy to one of the fastest growing in the world. We will be celebrating with you, remembering the part our country played in your liberation struggle. I myself remember the momentous days of the “Stop Genocide, Recognise Bangladesh” rally in Trafalagar Square; George Harrison’s benefit concert in New York; and reports in the British papers about Bangabandhu’s return via London to a newly independent Bangladesh. 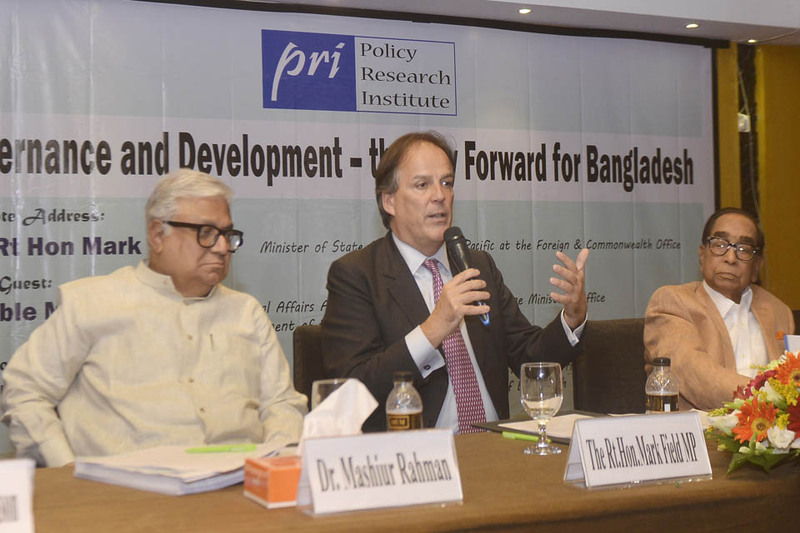 Today, Bangladesh can be proud of the huge progress it has made against the Sustainable Development Goals. With the pioneering work of Grameen Bank and BRAC, Bangladesh has shown how development best practice can be applied effectively for the benefit of your citizens. Your country has been able to make such huge strides thanks to a combination of good development policy, international partnership – including with DFID – and a resourceful private sector. Your just reward – of reaching Middle Income Status – is within your grasp. That is an exciting prospect, as are the growing opportunities for collaboration. We are already working together on climate change – a defining challenge for our times. As a challenge that particularly affects Bangladesh, you have valuable lessons on resilience to share with the rest of the world. We are also working together as fellow members of the Commonwealth. Her Majesty the Queen was delighted to welcome Prime Minister Hasina at the Commonwealth Heads of Government Meeting last year in London. Our nations are working together to tackle the evils of human trafficking, which is a particular priority for both our governments, and in which we are investing substantially. On a practical level, we have been pleased to help improve aviation security standards in Bangladesh, to the point where air cargo can once more travel directly from here to the UK. Something else we share is our diversity – in both Bangladesh and the UK, people of different backgrounds – Muslims and non-Muslims – live side by side. In our increasingly divided world, we must continue to promote this model of co-existence and inclusion. I should like to take this opportunity to offer my personal condolences, and those of the British Government, to the families of those Bangladeshis killed in the appalling attack in Christchurch. Their deaths, and the narrow escape of your cricket team, were yet another tragic reminder of the dangers of hatred and extremism. But the response to the attacks – both from the local Muslim community, and wider society – has also been a reminder that people overwhelmingly reject this hatred, and instead want to bridge divides, heal divisions and promote understanding. We shall be discussing all these issues and more during the third UK-Bangladesh Strategic Dialogue later this month, along with our shared ambitions for our future partnership. I am confident that we can achieve those ambitions, if we stay true to our democratic values. It is often said that democracy was the worst form of government – apart from all the others; and events continue to prove him right. You will be well aware that the British Parliament is currently wrestling with the complexities of implementing the British people’s decision to leave the EU. Some have suggested that this lengthy process means democracy has somehow failed. As an elected parliamentarian, I can confidently say that the opposite is true: it is democracy in action – with all its imperfections. And as a friend of Bangladesh I profoundly hope that, as Bangladesh graduates to middle income status, it will remain true to its democratic values. That means holding elections that are fair, and that present voters with a free choice. Again, as a friend of Bangladesh it gives me no pleasure to say this, but I fear the Parliamentary elections which took place here in December did not meet this standard – as I said at the time. I also pressed for a full, credible and transparent resolution of all complaints. I think we all recognise that the notion of choice is crucial in any healthy democracy. Without it, there is a risk that voters might seek other ways of achieving the changes they want. Ultimately, that could pose a much greater threat to stability than allowing them to express their views through democratic channels. That is why it is so important to have a political opposition in place, one that is able and willing to hold the Government to account and offer an alternate view. And it is also why it is so vital to allow space for a vibrant civil society, through which the people – and especially young people – can channel their energies, and indeed their frustrations, within the law. That means upholding Bangladesh’s fine tradition of allowing people to voice dissent and express themselves freely. It also means allowing the media to do its job of holding the powerful to account, which as we all know is so crucial in upholding the transparency and credibility of our institutions, and bearing down on corruption. This really matters, because the strength and accountability of our institutions, and the confidence that they inspire in investors, are also crucial to our democracies – and to our economies. The UK stands ready to help invest in those young people I mentioned just now, as another crucial element in the future success of this country. Every time I come here, I am struck by the energy and talent of the people. I would very much like more of them to have the opportunity to benefit from the UK’s world class educational institutions. That is why one of the things I shall be discussing with my counterparts on this visit is the possibility of opening the local education market to greater competition. I am sure that this will be a win-win for Bangladesh – good for your talented young people, and good for the country. To conclude ladies and gentlemen, the bonds of history and kinship between our countries make our relationship particularly strong and deep. As a long standing friend, the UK welcomes the great strides that Bangladesh has made over the last half century, and recognises the great potential it has to achieve still more in the next. And as a close friend I can speak frankly and say that what we want to see is a confident Bangladesh, with strong, transparent and accountable democratic institutions. We want to see lively debate, a vibrant civil society, and competitive elections. And we want to see this flourishing democratic landscape carefully scrutinised and held to account by a free and vibrant media. That would be a wonderful vision for Bangladesh in its second half century, and it would also be the best way for it to realise its undoubted potential. The UK stands ready to help Bangladesh achieve that potential, in whatever way we can.